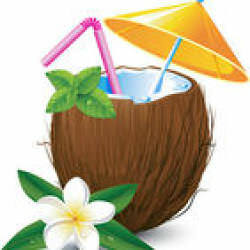 did you gutys know that coconut is probably the most healthy energy source on the planet? its fat contains 50% MCT, the highest in natural sources. MCT gives you energy, while does not require bile acids to digest, can’t form fat tissue, does not contribute to plaques and overall does not cause any damage. more to that, it rises HDL cholesterol, thus reduces the risk of cardiovascular diseases. Very cool. Recently I picked up the book Coconut Cures by Bruce Fife and I’m looking forward to reading it, although I’m already convinced of the benefits of coconut oil. Personally, I find it tastes quite good drizzled over Greek yogurt with just a splash of maple syrup and a dash of cinnamon. There’s nothing like sipping a fresh coconut on a beach! Mmmm, un coco frio Mexican style, with lime and chili.